How do I install phpMyAdmin to handle the administration of MySQL database server over the World Wide Web under Fedora / Scientific / CentOS / RHEL / Red Hat Enterprise Linux 6.x server systems? 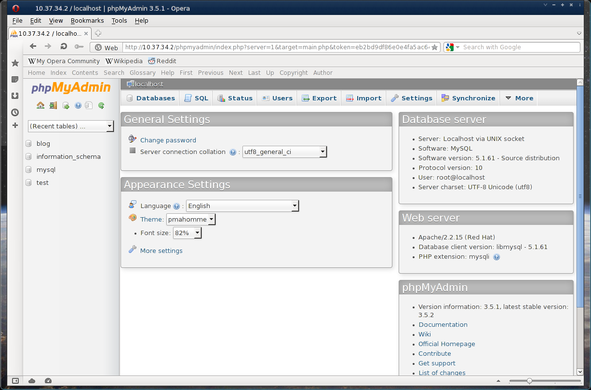 phpMyAdmin is a tool written in PHP intended to handle the administration of MySQL over the World Wide Web. Most frequently used operations are supported by the user interface (managing databases, tables, fields, relations, indexes, users, permissions, while you still have the ability to directly execute any SQL statement. It comes with an intuitive web interface, support for most MySQL features. You should follow me on twitter here or grab rss feed to keep track of new changes.